샤카디타 코리아는 지난 7월 페이스북 페이지(https://www.facebook.com/sakyadhita.kr)를 개설하였고, 샤카디타의 여러 지부로부터 축하의 메세지를 받았습니다. 그 중에서도 아낌없는 관심을 보내주었던 알탄체첵크와 페이스북 메신저로 인터뷰한 내용을 싣습니다. 척박한 환경에서 샤카디타의 활동을 꽃피우기 위해 어떤 일을 하고있는지 물어보았습니다. 안녕하세요? 본인 소개를 부탁드려요. 이름, 국적, 불교를 처음 배우게 된 경위 등을 말씀해주세요. 제 이름은 알탄체첵크(Altantsetseg)이고 저는 몽골 서쪽에 위치한 자브항주의 테스지구에서 태어났어요. 지금은 시골에서 아들, 딸과 함께 살고 있고, 제 형제는 모두 칠 남매인데 제가 맏이에요. 저는 어려서부터 불교를 알고 지냈어요. 아버지께서 오랫동안 몹시 아프셨는데, 스님을 집으로 초대하여 아버지에게 가르침을 주기를 청했어요. 스님은 우리에게 찬불가를 암기하고 기도문을 암송하도록 했어요. 저는 수많은 밤을 기도문을 암송하면서 눈물로 보냈어요. 신에 대한 제 믿음은 이 일에서 시작되었다고 믿어요. 외증조부가 유명한 법사셨어요. 외증조부와 증조부 형제는 아주 현명한 분들로 가치있는 삶을 사셨죠. 저는 제 조상님과 고향이 자랑스러워요. My name is Altantsetseg and I was born in Tes sum of Zavkhan province, which is located in the western part of Mongolia. Currently, I live in the countryside in Mongolia with my two children, a daughter and a son. I also have six siblings and am the oldest child in my family. I have known about Buddhism since my early childhood. My father was very ill for a long time, so my family invited lamas to relay teachings to my father. The lamas wanted us to memorize some megzems and to recite maani, or prayer. I spent many nights repeating the megzems and maani with tears in my eyes. I believe this was the beginning of my belief in God. My great-grandfather on my mother’s side was a popular gevsh (a lama with a clerical degree). My great-grandfather and his siblings were very clever men who lived valued lives. We are proud of my ancestors and our homeland. 샤카디타와는 어떻게 인연을 맺게 되었나요? How did you become connected to Sakyadhita? 2010년 10월에 울란바토르에서 열린 샤카디타 대회에 참가했다가 회원으로 등록했어요. 2012년 3월에 세계종교여성협회가 주최한 대회에 참석하기 위해 카르마 렉셰 쏘모스님과 크리스티 선생님이 특별손님 자격으로 울란바토르에 왔어요. 그 대회를 위해 시골에 사는 사람 중 다섯 명의 인터뷰 대상자를 선발했는데, 제가 그 중 한 명으로 선정되어 대회에 참석하게 됐어요. 2013년 1월에 인도에서 열린 제 13차 샤카디타 세계불교여성대회에 초대를 받고 참가했어요. 이 대회 참석이 저에게는 여성불자로서 처음 해외에 나간 거 였어요. 2013년 7월에 쏘모스님이 대표단과 자원봉사자 한 분과 함께 몽골에 오셨어요. 방문기간 동안 그 분들은 제가 증조부로부터 물려받은 것을 정말로 좋아했어요. 게다가 저는 쏘모스님과 크리스티 선생님에게 연락하여 제 활동을 공유할 수 있었어요. 자윈봉사자는 마을에 3개월 머물면서 영어를 가르치기도 했어요. 지금까지 그 분들과 연락하고 있어요. 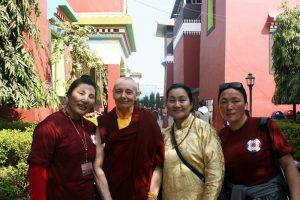 In October 2010 I participated in a Buddhist Women conference in Ulaanbaatar and enrolled in the International Sakyadhita Association. In August 2012 the honored guests from the World Religious Women’s Association - Karma Lekshe Tsomo and Christina - came to Ulaanbaatar. At that time, five people were chosen from the countryside areas to have interviews. I was one of the interviewees and got an opportunity to attend the conference. In January 2013, I received an invitation to attend the 13th Sakyadhita conference in India. It was to be my first visit abroad as a Buddhist woman. Then, in July 2013 Karma Lekshe Tsomo came to Mongolia with some delegates and a volunteer. During their visit, I recognized that the people really liked the items passed on to me from my great-grandfather, and I was able to connect with Lekshe Tsomo and Christina and share my works with them. The volunteer also stayed in our village for three months to teach English. To this day, I have stayed connected with these dear people. 지금 샤카디타 몽골이 당면한 과제는 무엇인가요? What challenges does Sakyadhita Mongolia face today? 지금 샤카디타 몽골은 많은 문제를 안고 있어요. 몽골 불교계는 여전히 젠더적으로 불평등합니다. 자체 사무실도 아직 없고 기본적인 자금과 필요한 자원을 아직 확보하지 못한 상태예요. 추가로 말씀드리면 관리자와 교사 등 인력자원의 부족뿐 아니라 재정난 또한 겪고 있어요. Sakyadhita Mongolia faces many problems today. 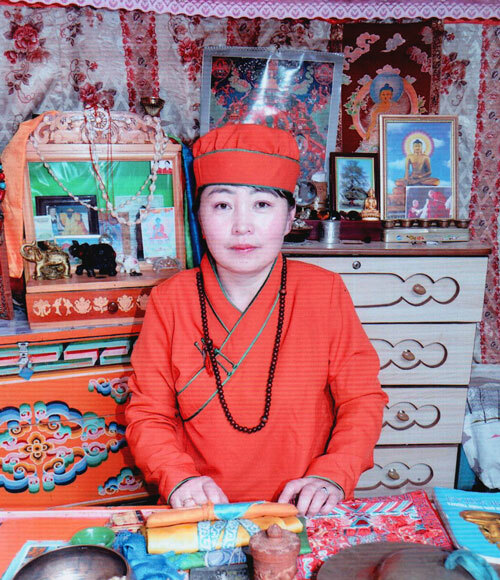 There is still gender inequality within Buddhism in Mongolia. We also don not have our own office, basic sources of capital, and other essentials that help Sakyadhita Mongolia. In addition, there are financial difficulties as well as a lack of human resource managers and teachers. 샤카디다 몽골은 불교계의 젠더불평등 문제를 개선하기위해 어떤 활동을 하고 있는지요? 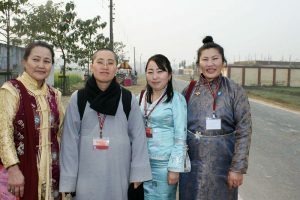 How has Sakyadhita Mongolia been working to establish greater gender equality within Buddhism? 샤카디타 몽골은 불교계의 젠더불평등을 개선하는 활동을 아직 못하고 있다고 생각해요. 불행한 일이지만 인도의 경우 불교학교에 진학하는 학생 15명 중 여학생은 고작 한 명 내지 세 명밖에 되지 않아요. 그래서 제가 이 문제에 관한 정보를 미국 불교학교에 보냈어요. 미국 학교에 계신 쏘모스님 이하 관계자들께서 내용을 받아보시고 이와 같은 유감스러운 상황을 알게 되었어요. 개략적으로 말씀 드리면 사람들이 사캬디타라는 단체가 있는지는 알지만, 샤카디타 몽골에 현존하는 젠더불평 등 문제를 국내적으로 그리고 인도에서와 같이 국제적으로 해결하기 위해 무엇을 하고 있다라고 딱히 사람들에게 할 말이 없어요. 오히려 몽골 시골지역에서 성과를 내며 활동하는 단체는 기독교 지역공동체예요. 예를 들자면 그들은 사무실을 지어주고 지역 사회복지사의 임금을 지불하고 무상교육도 제공해요. 또한 빈민에게 음식과 생필품을 주기도 하지요. 다른 샤카디타 지회가 젠더평등을 향상시키는 데 괄목할만한 성과를 내기도 하지만 중대한 결과를 이루기 위해 샤카디타가 갈 길은 아직 멀어요. 샤카디타 몽골이 외적인 발전을 이루기 위해, 어떻게 내부적으로 조직을 강화할 것인가를 고민할 때, 몽고의 기독교 지역사회를 모범으로 삼을 수 있을 것 같아요. In my opinion, Sakyadhita Mongolia has still not been working to establish greater gender equality within Buddhism. Unfortunately, in India, only one to three female students among 15 students are going to Buddhist schools. Therefore, I sent information about this problem to a Buddhist school in the United States, which Lekshe Tsomo and her people received and understood as a regrettable situation. Generally speaking, people know of Sakyadhita, but unfortunately there is little I can say about what Sakyadhita Mongolia is doing to combat existing gender problems both in Mongolia and internationally such as in India. Rather, it seems that the Christian communities have done much more in the Mongolian countryside. Although other Sakyadhita branches are making great strides to promote gender equality, Sakyadhita still has a long way to before being able to make a significant impact. Perhaps we can look to Mongolian Christian groups as an example of how to internally strengthen Sakyadhita Mongolia in order to make external progress. 샤카디타 몽골과 몽골 불교계에 대한 희망이나 바램이 있다면 말씀해주시겠어요? What are your future hopes and wishes for Sakyadhita Mongolia and for Buddhism in Mongolia? 저 개인적으로는 샤카디다 몽골의 미래가 아주 밝다고 봐요. 이런 밝은 미래 때문에 제 조상님께서 수백 년간 불교를 믿으신 거겠죠. 현재 몽골에는 여러 종교가 있기는 하지만 우리는 몽골의 전통종교인 불교를 여전히 믿고 있어요. 특히 시골지역에서 그렇죠. 제 바람은 시골지역 주민이 세계의 훌륭한 사람들과 연결되어 한국과 인도, 미국, 호주와 같이 새롭고 현대적인 선진국에 대해 눈을 뜨는 것이죠. 붓다의 가르침을 유지하기 위해 고군분투하는 사람들을 보며 그 분들께 배우는 일은 언제나 신나는 일이죠. 또한 저는 몽고 아이들이 어렸을 때부터 붓다의 가르침을 배웠으면 좋겠어요. Personally, I imagine a very bright future for Sakyadhita Mongolia. This is why our ancestors had believed in Buddhism for centuries. Despite there being many other religious denominations in Mongolia, our people still believe in their traditional religion of Buddhism, especially in the rural areas. I want to connect our people, who live in these rural areas, with great people around the world and open their eyes to the new, modern, and developed countries like Korea, India, the USA, and Australia. It is always wonderful to see and learn from others how they work hard to maintain Buddha’s teachings. I also wish for Mongolian children to learn about Buddha’s teachings from early childhood. 한국사람들께 더 하고 싶은 말이 있으신가요? 어떤 것이든 좋아요. 먼저 샤카디타 코리아와 인터뷰할 수 있어 너무 행복해요. 또한 몽골 유목민의 특징과 생활양식, 전통, 믿음에 대해 이야기할 수 있어 아주 기쁘구요. 저는 제 자신이 저희 가계에서 중요한 사람일 뿐 아니라 세상의 모든 존재에게 귀하고 충실한 사람이라고 여기고 있어요. 저는 이 생에서 축복받은 사람이라 생각하고 싶어요. 저는 육감을 통해 위대한 조상과 땅과 물의 정신에 접속합니다. 요새는 나와 같은 능력을 가진 사람에게 좋은 일을 많이 합니다만 사람들을 성공적으로 교육시키고 그들에게 깨달음을 주는 보다 신명나는 활동을 할 수 있기를 희망해요. 그래서 매년 제가 살고 있는 마을에서 종교축제와 예술축제를 조직하죠. 지난 5년 동안 400~500명이 이 축제에 참가했어요. 마지막으로 샤카디타 코리아에 관해 말씀드리면 한국은 참 아름답고 친근한 선진국이라 생각해요. 그래서 언젠가 샤카디타 코리아 활동가들과 얼굴 맞대고 앉아 샤카디타의 중요 활동에 관해 논의할 수 있길 희망해요. 이 인터뷰가 우리의 협력을 증진하기 위해 내딛는 첫 발이었으면 좋겠네요. 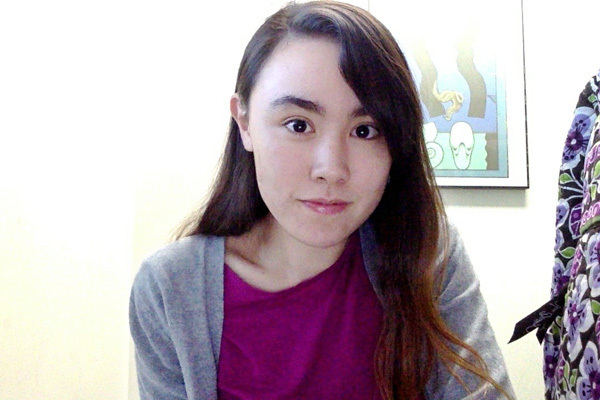 First of all, I would like to tell you how very happy I am to be doing an interview with Sakyadhita Korea. I am also very glad to be telling you about the features of Mongolian nomadic people and their lifestyles, traditions, and belief. I consider myself to be not only an important person in my family, but also to be a virtuous and dutiful person for all beings in the world. I would like to think I am very blessed in my life. Using my sixth sense, I connect with my great ancestors, land and water spirits. Nowadays, I do many good deeds for people with my skill, but I hope to do more exciting activities to successfully help educate and enlighten people. Thus, each year I organize religious festivals and art festivals in my village. About 400 to 500 people have participated in the festivals for the last five years. Finally, with regards to Sakyadhita Korea, I perceive Korea is a developed, beautiful, and friendly country. Therefore, I hope that one day in the future we can sit together and discuss the highlights of Sakyadhita International face-to-face. I hope this interview will be the first step to further our cooperation. 알탄체첵크는 우리가 샤카디타 몽골에 관심을 가져주어서 감사하다는 말을 남겼다. 앞으로 샤카디타 세계불교여성대회에서 그녀를 만나면 반갑게 맞아주시길 바란다.